The year is drawing to an end, and what a year it's been. So many well-loved celebrities have died, and politically, the world has gone to crap. But the year hasn't been all bad for me personally. There were some very real lows; the funeral of my nan's sister (she died just before Christmas last year), the first anniversary of my nan's death and my first birthday without her, the death and funeral of my nan's brother, being diagnosed with anxiety, and my dad and my brother falling ill in a serious way. But there have also been some pretty awesome highs. So I thought I'd look back over the year and talking about the brilliant things that have happened in my life in 2016. 2016 was the year my confidence in my writing grew, and I really started to believe in myself as a writer. When opportunites arised, I took them. 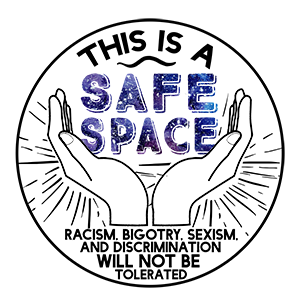 I became a team member of Safe Space - a blog that talks about all the things involved in life as a woman; a wonderful place full of honesty and acceptance, where the ladies get real, don't hold back, and make you feel a lot less alone - and had a wonderful six months there. I got such wonderful feedback on my posts, both from my fellow team members and from readers, and it was such a boost to my confidence. What was wonderful was hearing from people who would say they could relate to what I was writing. 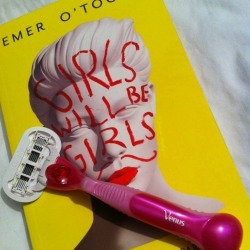 There's something uniquely special about discovering that someone else knows what you're feeling/thinking/experiencing by reading a post or article; I knew what that felt like as areader, but now I was discovering I was doing the same for other readers. 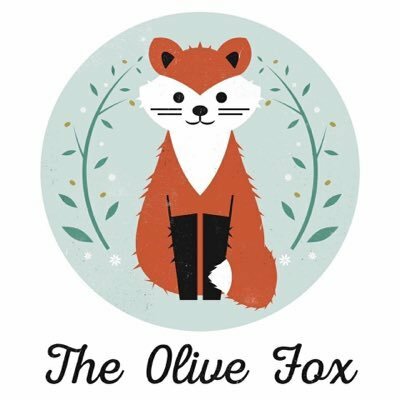 I decided I wanted to get my writing out there to more people, and 2016 saw me contributing to Zusterschap (which is no longer publishing, but has it's posts archived) and The Olive Fox, both online magazines, Maximum Pop!, a teen pop culture website, and writing again for The Coven, a website for essays, criticism, social and cultural history, and humour by women, and Geeked Magazine, an illustration-led magazine with an urban feminist slant on comics, culture and gender. I wrote about body image and weight, redheads and witches, love and friendship, fear and motivation, and the importance of diverse books. I'm really proud of the pieces I've written for these sites, but also of myself for taking the chance to reach out to the various platforms and pitch my ideas when rejection was possible. It's been exciting seeing my words appear elsewhere and see readers' reactions to them. It's been wonderful. And then there's Jo Scribbles itself. I moved it from Wordpress to Blogger, where I have more control without forking out for hosting and being completely confused by it all. It's also become a little more lifestyle-y than it was. Where before I was only writing about things that were important to me - feminism, body image/positivity, and self-confidence - I've now started writing a little more about the things I enjoy, or the things I'm experiencing. As well as being a place I share my opinions on topics I'm passionate about, it's also a place where I talk about me and my life - but yet still things I think will be interesting and/or helpful, or things I need to talk about, with some things just for fun. I'm really, really happy with where Jo Scribbles is heading, and with my writing over the past year. I love this blog and writing so much, and it's been absolutely wonderful to have this outlet. 2016 has also been the year of making new friends. First there's Caoimhe. We've "known" each other online since I was 18 and she was 17 when we were both fans of an unsigned Derry band, but we've been more online acquaintances rather than friends - who miraculously never deleted each other despite never really talking - until maybe two years ago, when we saw through Facebook that we had similar opinions of mental health and feminism. We started talking a little bit more, but it was this year that led to a real, close friendship. I wrote a post this year about wanting to write more letters, a post Caoimhe liked, and suggested we become penpals - so we did! Through our letters a strong friendship has formed, and even though our letters may not be regularly posted (we're both busy ladies), there have been tweets and emails and, a lot more frequently recently, texts. We may not have met in person yet (hopefully in 2017! ), but we are so similar in so many ways - we have similar morals and opinions, have had similar experiences - it didn't take long for our friendship to become a strong friendship. Caoimhe is now one of my closest friends - I'm just a little mad it took 11 years for us to really start talking! Then there's Suzy of From the Fringe and Kathy of I am Kathy B. Both of these ladies are bloggers who I look up to and admire, but have crossed over from simply being bloggers I aspire to be like, to friends. Kathy was a huge support and help to me when I was diagnosed with anxiety; she understood, she listened, and she gave advice. Her friendship was invaluable when I was really struggling, and I'll never be able to thank her enough for reaching out to me on Twitter when I was diagnosed. Suzy's blog is a ray of sunshine full of positivity and joy, and she comes across as someone you just want to be around. Through commenting on each others' blogs and Twitter, we've become pretty friendly; I've gone to her for feminist advice, and she's been a huge support of my blog and my writing - and she even sent me a gift as a thank you for supporting her blog! They're both lovely ladies with beautiful souls, and though they're fledgling friendships, I'm hoping 2017 will see us becoming better friends. If you had told me this time last year that in 2016 I would be using an online dating app and going on dates, I would have laughed at you. There was no way I would be brave enough to do that, no way. Yet that's what I've been doing. And though 2016 will end with me still single, that's ok. I've worked out what I want and I'm putting myself out there, rather than sitting around waiting for something to happen. And though it's been scary and exciting, fun and disappointing, I'm mostly just proud of myself for giving it a go and going after what I want. That in itself is a pretty big acheievement for someone who found the prospect of dating pretty damn terrifying. And you never know, 2017 may be my year. 2016 saw quotes from my book reviews on Once Upon a Bookcase make it into the praise pages of five books and a proof. 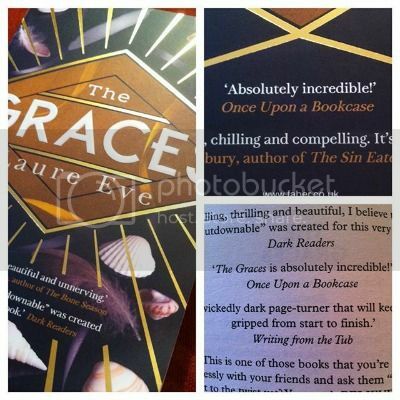 Not only that, but this year a quote from my review of The Graces by Laure Eve actually made it to the back cover of the finished copy! This was so exciting for me! It never gets old to see a quote from one of your reviews make it to a book, no matter how many times it happens, but to make it onto the back cover, that's just amazing! Although it's happened to a few other fellow book bloggers I know a number of times, it's never happened to me before, and it was such an incredible surprise! It brings my total number of books I've been quoted in to 22 (not including the proof), and it's just wonderful! So they have been the high points of my year! What have been the highs of yours? And what do you have planned for 2017? Me? I'm planning on getting a hair cut and buying some new clothes to start off with, and then more dates, and maybe some adventures. I have a new diary and I plan on filling it with all kinds of exciting things - though what they will be, I don't know yet. Hope you have a wonderful time tonight as you see out the end of the year and ring in the new! And I hope your 2017 treats you well!